Tarantulas are bigger and hairier spiders. Found in the Americas, Africa, and Asia, they mostly eat insects and smaller spiders, while larger species can eat lizards, mice, birds and snakes. If you really want to find one, they will be in dryer areas such as deserts and grasslands. Even though they can seem quite scary, they are becoming popular pets for kids and adults. So that raises an important question: are they poisonous? Let’s get the worst part out of the way: yes, they bite and yes, there is venom. Since in the wild they typically go after prey smaller than a human, the venom isn’t designed to kill us. The venom of most tarantulas will cause the type of reaction one would get from a bee sting. But just like a bee sting, some people just get pain, redness and swelling, while others have an allergic reaction and go into shock which is a dangerous situation. There are a few species, however, that have extremely dangerous venom and, depending on the age, size and health of the person, could cause serious symptoms including death. So the simple answer to “are tarantulas poisonous?” is sometimes. 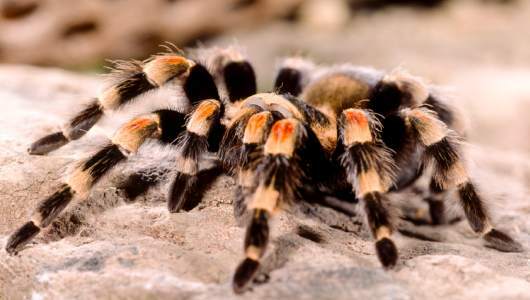 In addition to the venom, some new world tarantulas also have specialized hairs on their bodies. When threatened or even just touched, the hairs can be released. Don’t be dismissive of contact with the hairs. While usually just a nuisance, in many ways it can be worse than the results of a bite. These hairs are barbed. If these hairs go on the skin, they will cause mild to moderate irritation and inflammation, treatable with cortisone ointment or something similar. The danger is when the hair gets into the eyes or mouth, as the inflammation will be much more severe in these locations. If you have inhaled the hairs, you may find you have cold like symptoms such as running noise, sneezing, congestion and sinus pressure. Hairs in the eyes can cause ocular injuries. Care should be taken after handling a tarantula or spending time in or near its cage to make sure that any skin or clothing that may have its hairs are properly cleaned. What If You Are Attacked by Tarantulas? Apply a cool compress or ice cube to help with the inflammation. Apply cortisone or Benadryl cream for irritation. Stay alert for any signs of infection or allergic reaction. Be sure not to inhale any of the hairs. Try using tape, wax or tweezers to take off as many hairs from the skin as possible. Use steroid creams for several day until the inflammation goes down. If hairs did get into your eyes or have been inhaled, seek medical care. Stay alert for any signs of allergic reaction or infection. Due to the answer to "are tarantulas poisonous?" you may want to be very careful when handling them. Tarantulas, unlike cats or dogs, have not been bred to be companions to humans, so they do not understand what we are doing and what intentions are when we get near them. Below are two ways with which you can avoid an unpleasant interaction. Just like with humans, tarantulas have good days and bad days. And, just like with humans, it’s best to avoid them on their bad days. When you want to pick up a tarantula, approach it slowly, quietly, and calmly. Then, perhaps, you could use a tool such as a paint brush and gently nudge it. What happens next is important; if it moves quickly, runs away, or attacks the tool, it’s not in the mood and should be left alone. If it moves slowly or not at all, you are good to go. Put your hand in the tank and let it walk onto your hand. Make sure that all legs are supported at all times. If the tarantula feels like it is about to fall, it may become scared and act aggressively. In addition, make sure that you hold it above a surface or while sitting down. Also, keep an eye on the activity of the tarantula. Sometimes it is quite active and wants to crawl around a lot. Keep switching from hand to hand to keep it in your hands only. It’s best not to let the tarantula move to other parts of your body as you may not know what will happen. If it goes to another part of the body and you need to grab it, it may become defensive and bite or shed some of its hairs.